Callie's father is missing. He disappeared one day and there seems to be no trace. After a period of mourning Cassie decides to look into the matter herself. She can't find a single trace of him. While she speaks to many people nobody seems to have a clue where he could be or what could have happened to him. The only link Callie has is an old photograph of the Great San Francisco Earthquake, but that's bizarre or isn't it? Callie doesn't have to search alone. She has her best friends Beckett and Madison who are often by her side. They distract her by discussing their love lives and they do their best to help her with her search. Callie tries to find some normalcy again, she's running, she loves her band and possibly there's even room for love, but she doesn't give up on her father. She misses him terribly and keeps remembering every small detail of their connection. Will she be able to find him again? 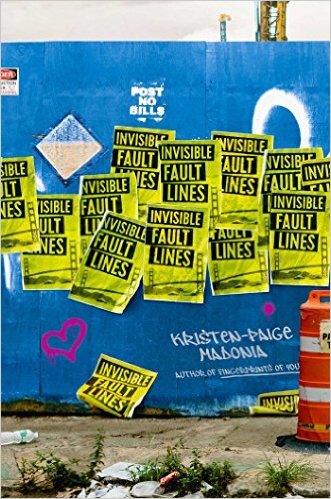 Invisible Fault Lines is an original story. I expected something completely different and was amazed by this special story. I was intrigued straight away as this book is unusual in a really good way and I couldn't put it down. I loved Callie, she's a sweet and loving person and she's also strong and resilient. She keeps going to school, she keeps playing music and she keeps doing her job. 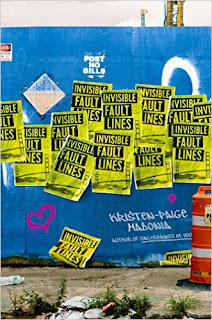 Her life has changed with the disappearance of her father, but she tries to make the best of her situation. The mystery around the missing father is something that made me instantly curious. I couldn't wait to find out more. There are two different points of view, Callie's and someone else, a fascinating choice that increased my interest in the story even more. Must be a good book. You did a good job making a perfect overview of the story. If you were the owner of the book i'm pretty sure you already made a good sell with this post. I wish we have a writer of your caliber at our team so whenever i mess up you could rewrite my essay fast and effortless. Thanks for this share. I am trying to figure out how an earthquake photo would be related to a missing person's case. Interesting! I've always been intrigued by the Great Quake, so this sounds cool! I'm glad Callie has her friends to lean on.